Head to the Hills Golf Fest is a free family-friendly event being held on Saturday, May 13 from 2:00pm to 5:00pm at Palatine Hills Golf Course, 512 W. Northwest Hwy, in Palatine. Head to the Hills is open to the community and will include a variety of free games, clinics, contests, and raffles. Food and beverages will be available for purchase at the Palatine Hills Clubhouse. Golf professionals and course staff will be available at the driving range to help guests work on swing basics and use of fairway woods, hybrids, and drivers. 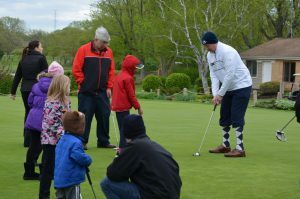 On the putting green, guests can get instruction on putting, chipping, and bunker shots. The FootGolf course will be open for a mini tournament starting at 2:00pm until approximately 3:30pm. FootGolf is a hybrid sport that combines the games of soccer and golf. Players follow rules similar to golf rules to kick a soccer ball into the 22” hole. Contests will also be held throughout the course grounds, including long drive, putting, short game, and closest to the pin. Palatine Park District’s own Sammy the Squirrel will be on site for children to meet. Free raffles and giveaways will also be available. In addition, valued lawn advice will be shared by course care professionals. For more information on Head to the Hills Golf Fest, FootGolf, or Palatine Hills Golf Course, contact Dan Hotchkin, Head Golf Professional, at 847.359.4020 or dhotchkin@palatineparks.org.